One morning last December, when I was nearing the end of my pregnancy, I woke up in a state of panic. After a dream where I'd missed Essley's first appointment with her pediatrician because I was so overwhelmed with first-time-mom-to-a-newborn craziness, I was convinced that I'd forget about absolutely everything I'd have to do for her in real life too. I spent the next hour downloading a myriad of apps to my iPhone that each claimed to be the perfect 'baby schedule guide.' They came with reminders, calendars, alarms, and more. I was confident that with all of these apps right there in my phone, I'd be prepared and never miss an appointment, feeding, nap, or play date. When Essley was born, I religiously updated all of my handy mommy scheduling apps - for about a week. As sleep deprivation mounted, I realized how much work it was to remind myself to enter and check things off in my phone, and the app usage started to dwindle. By the time she was two months old, I'd deleted all of them. I knew that my memory was pretty much the least reliable way to keep track of everything, so I started scribbling notes with pencil onto my work calendar. It didn't take long for me to come to the conclusion that combining baby tasks and work tasks into one daybook was a bad idea as well. By now it was already well into spring, and going out and grabbing another 2014 planner was no longer an option. 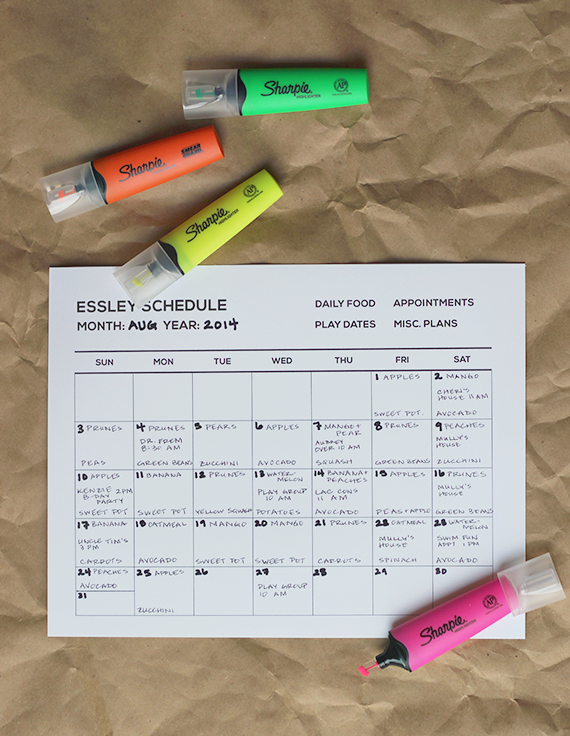 So I sat down and my computer and designed a monthly calendar in Photoshop that I could print out and devote exclusively to Essley. This was a huge help - it was so much easier for me to just have her schedule right in front of me, and it was good to know that if I screwed up, I could quickly print out another copy. I noticed recently, though, that the calendar days where we had a lot going on were looking awfully jumbled. We introduced solid foods a couple of months ago, and I've been writing down what she eats for each meal, which was starting to blend in with appointments and other plans. 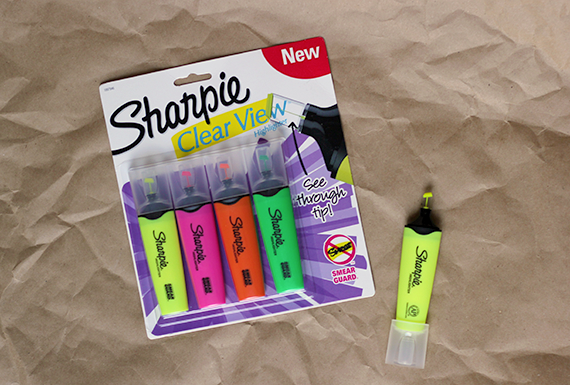 So I decided to take things up a notch, and headed over to Walgreens to grab a pack of Sharpie Clearview Highlighters. 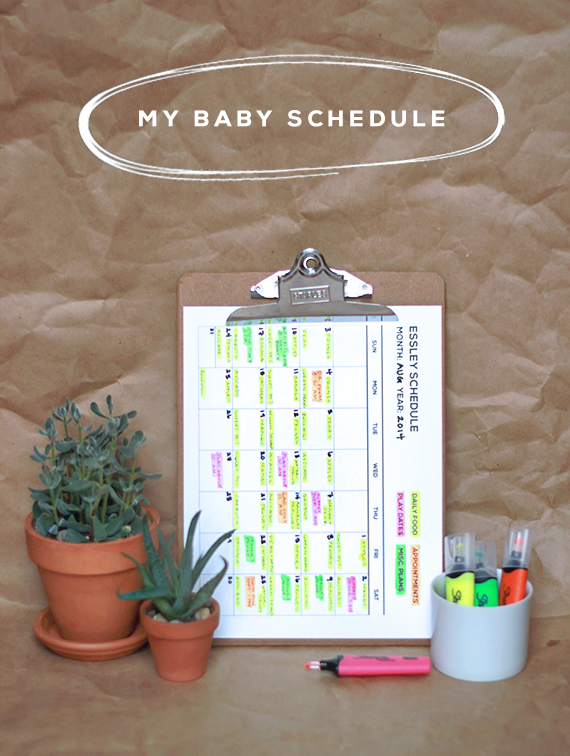 And, with their help, my trusty baby schedule instantly became a whole lot more organized. I assigned each of the four different colors to a different category of tasks: yellow for food, pink for play dates, orange for appointments (pediatrician, etc. ), and green for miscellaneous plans. 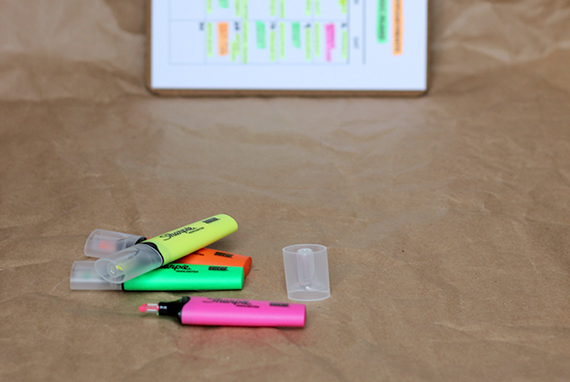 Then I highlighted all of the tasks and events I'd recorded based on their respective colors. 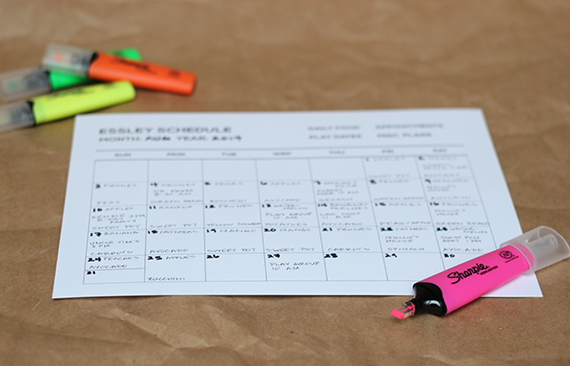 I'm telling you guys - a little color coding can suddenly make your schedule appear infinitely less hectic. 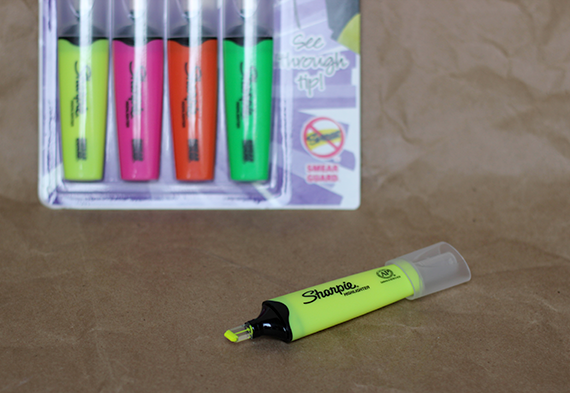 The Sharpie Clearview Highlighters are so great too, because they don't smear (woohoo to that! ), and they have a clear tip, which allows you to see exactly what you're highlighting as you move the marker across the text. I'll also confess that as much as I am attached to my phone, I much prefer to look at physical paper in front of me when it comes to calendars. And when I can make that paper look somewhat cute, it's a bonus. Creating these little baby schedules feels more like an art project to me now. I'm all about giving everyday organization a creative vibe, and what used to feel like a chore is now actually kind of fun. For those of you with babies (or older kids too), you can download and print out the monthly calendar that I created right here. It's a very simple design, but I created it that way in an effort to allow for lots of customization. Print it out, go grab yourself some Sharpie Highlighters, and report back to me with how much more organized you feel in a couple of days. Do those of you who keep baby/kid schedules have any other organizational tips for keeping everything on track? I also love the Sharpie brand. The permanent markers are a huge fave, especially since they have every color you could ever want. 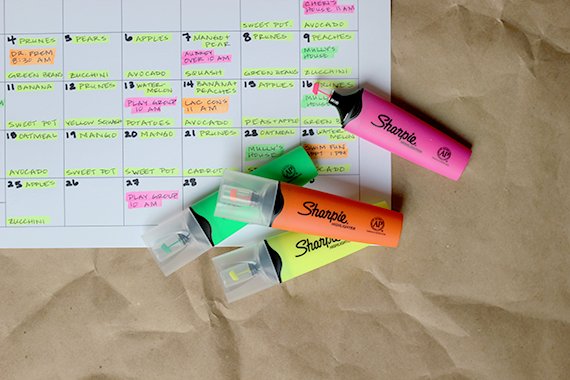 We haven't tried these highlighters yet, though. Great review! PS - Thanks for the freebie. I'm pinning your post. Awesome! I too love having a physical document in front of me instead of fiddling on my phone. No matter how much I love my phone its just not the same. And I love the no smearing highlighters how kool are they! I would have saved a lot of drying time in my school days if these had been available. I have four kids... I use a paper planner that I put on the fridge.... There is no way you can stay on top on things, and remember everything when you are looking at your mobil ! 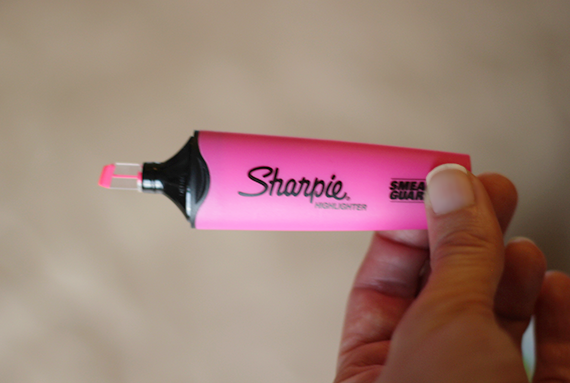 I love those Sharpie highlighters! And you are super organized!! Genius! I love color coding. As much as I love my smartphone, when it comes to staying organized and taking notes, I love the old pen and paper! I love crossing things off my list and seeing accomplishment. And I have to have a physical calendar to write things on! 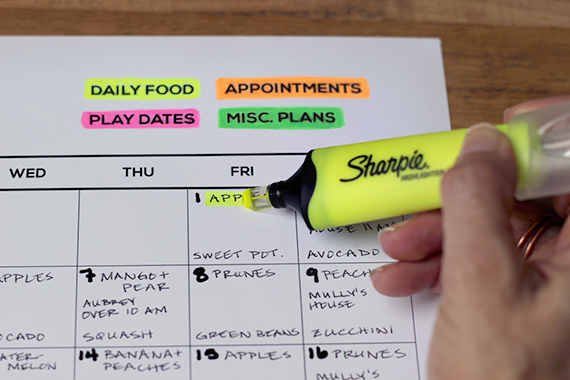 Great idea with the highlighters too.